All my best traditions are stolen from my parents, and this one is no exception. In my family growing up, we were reasonably healthy eaters, and we never ever ever had sugary cereal. On the morning of your birthday, the whole family would march into your bedroom singing “Happy Birthday” and bearing a tray with a bowl of mega-sugary cereal. There were three great parts to this tradition. First, it was really exciting to have a cereal you never got to eat the rest of the year. 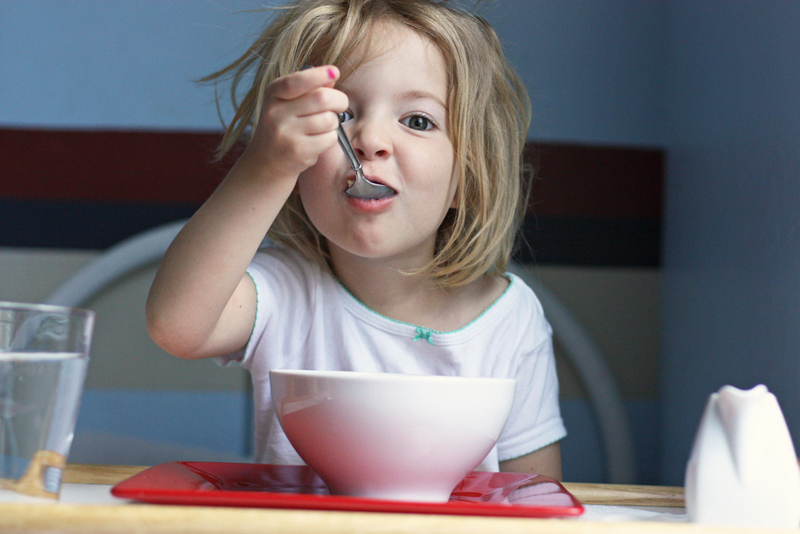 Second, it was fun even when it wasn’t your birthday because you got to have a bowl of sugary cereal after the birthday child had their bowl. And third, you can’t get easier than a bowl of cold cereal. No waking up early to make waffles or pancakes or french toast. Five is the age it started in my family because it’s old enough to (hopefully) eat in bed without spilling everywhere. 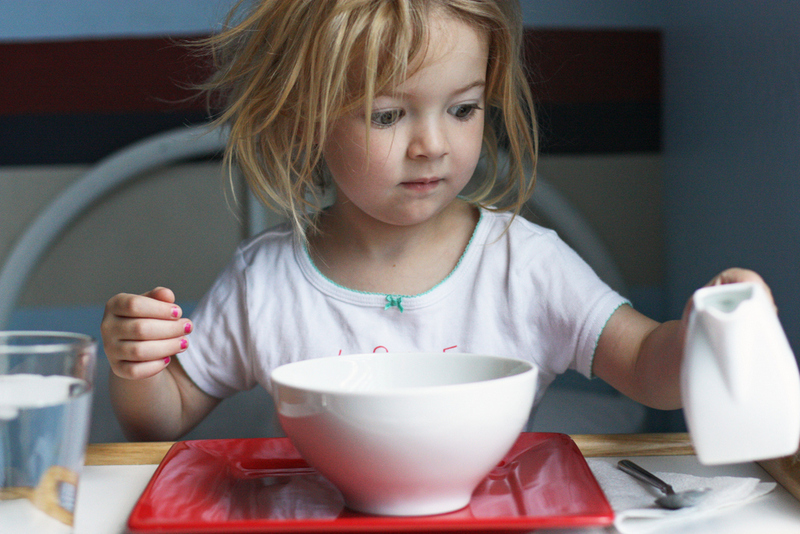 Happily, on Saturday morning, Ella successfully ate her Lucky Charms without spilling a drop (and the rest of us ate bowls on the bedroom floor without incident too), and it may well have been the highlight of her birthday. That, or the Frozen bike she got. It might be a toss-up. this is so adorable! happy belated birthday to Ella. My mum never did any traditions – womp womp. I hope to overdose my kids with traditions like this. Love it. My family use to do this too but we could get poptarts in bed! And Happy Birthday to Ella! Well this is just super fun! 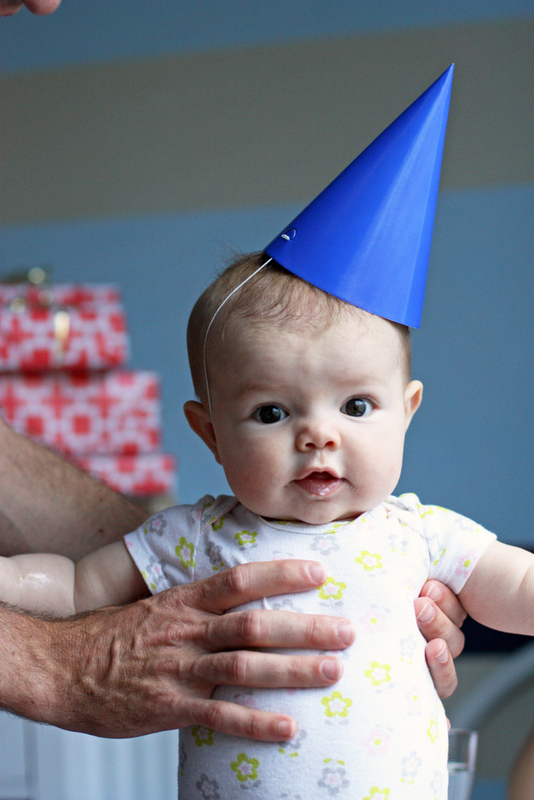 Are you kidding me with Baby M in a birthday hat?! Cutest girl. I grew up with the sugar cereal birthday tradition too, and I think it's the best. Oh My Word!!! Her bed hair is simply precious!!! What a fun birthday tradition! Happy Birthday Ella! 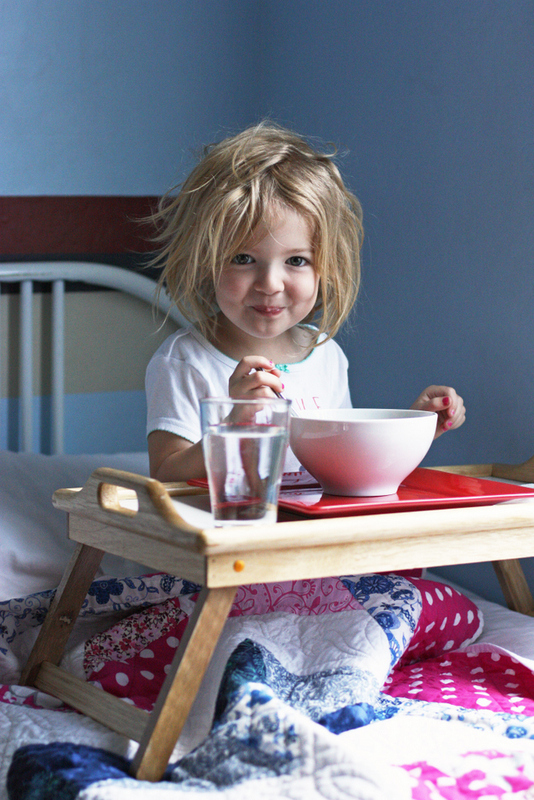 Love her adorable bedhead. Growing up my parents allowed us to designate one of our birthdays (there were three of us) as "junk food day." We got to request whatever junk food we wanted and we could eat it ALL day, no limits. It was amazing. This is such a fun and cute tradition! Reading your blog makes me want to steal every brilliant idea you've ever had, and this is one of them! Fun idea– and way to go for no one SPILLING! so fun! we only have sugary cereal on Christmas (everyone gets their own box) and it is so fun. I love Ella's fantastic bed head. I hope she had a great day. These are the sweetest pictures! I just cannot get over her bed head! I was going to say the same thing!! Love these pictures. I also agree with this! The bedhead might just be the darlingest thing ever! the pictures are so precious!